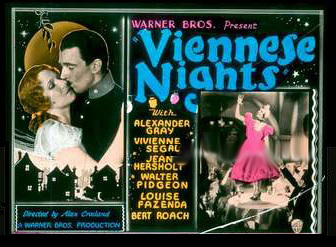 Filmed using a two-strip Technicolor process, Viennese Nights was the second of only four colour films featuring Bela Lugosi, the others being the Hungarian language version of King of Jazz (1930), in which he appeared as the MC, 50,000,00 Frenchmen (1931), of which only an edited black and white print appears to have survived, and Scared To Death (1947). 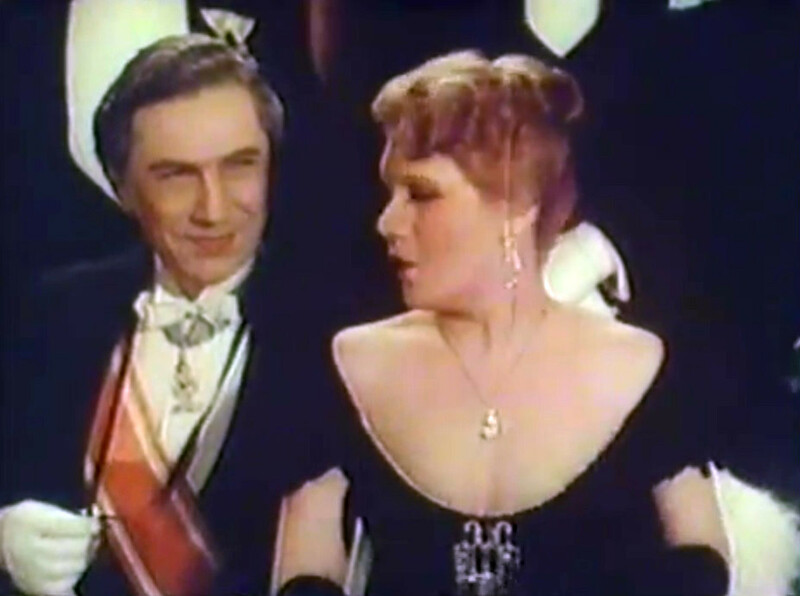 Bela Lugosi appears in a small uncredited role as an ambassador in this operetta. Freddie Burke Frederick: Otto Stirner Jr. 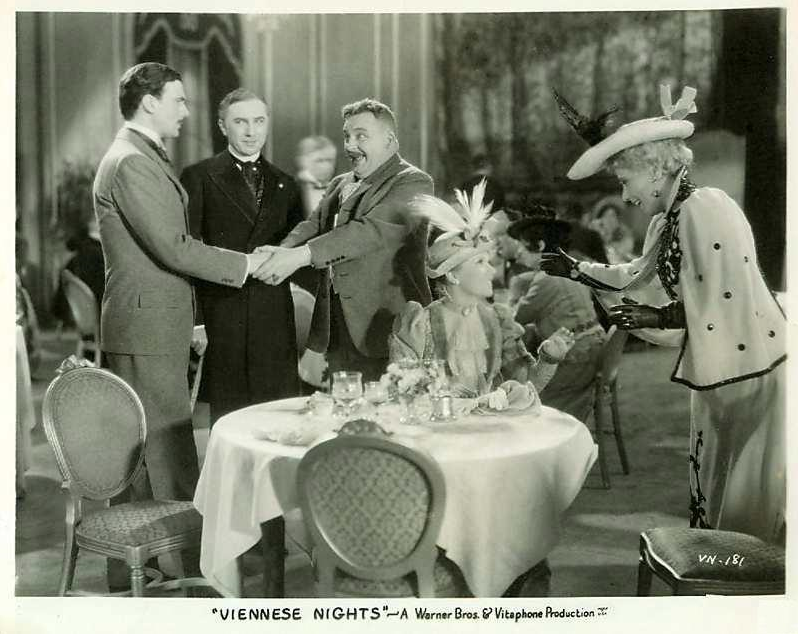 Appealing musical compositions, agreeably sung and well played, compensate for imperfections in the dialogue and story of “Viennese Nights,” a Vitaphone operetta in Technicolor, which was offered last night by Warner Brothers at Warners’ Theatre. A few sequences may be a trifle slow, and when Alan Crosland, the director, indulges his fancy in imaginative episodes he frequently gives too much of it, but nevertheless this is a picture with virtues that decidedly counterbalance its shortcomings. In fact, when one harks back to some other film operettas this feature reveals marked progress. 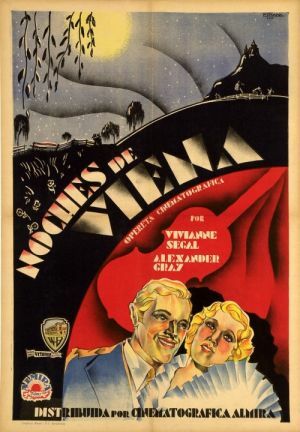 In the program it is set forth that the story is based upon a romance written specially for the screen by Sigmund Romberg and Oscar Hammerstein 2d. 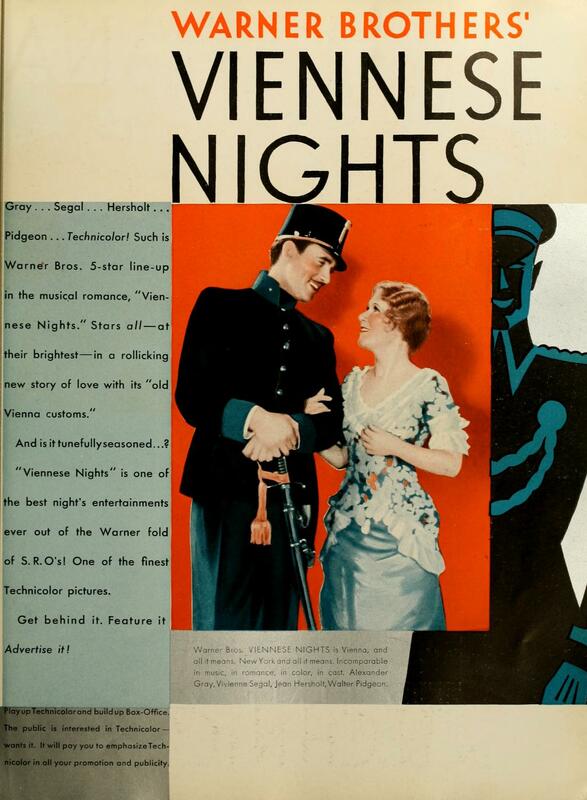 It is a happy-go-lucky affair which at times recalls Jessie Fothergill’s novel “The First Violin,” and in the closing chapters it possesses incidents that suggest Noel Coward’s production “Bitter Sweet.” It is primarily a musical entertainment, but at the same time one in which its none too novel narrative often captivates one’s interest. The fact that the characters suddenly give vent to their feelings in song and that they are occasionally accompanied by an unseen orchestra, does not worry one, because the singing is invariably satisfactory and the ballads are beguiling. Alexander Gray acts well and sings with an effect that is rarely heard from the screen. 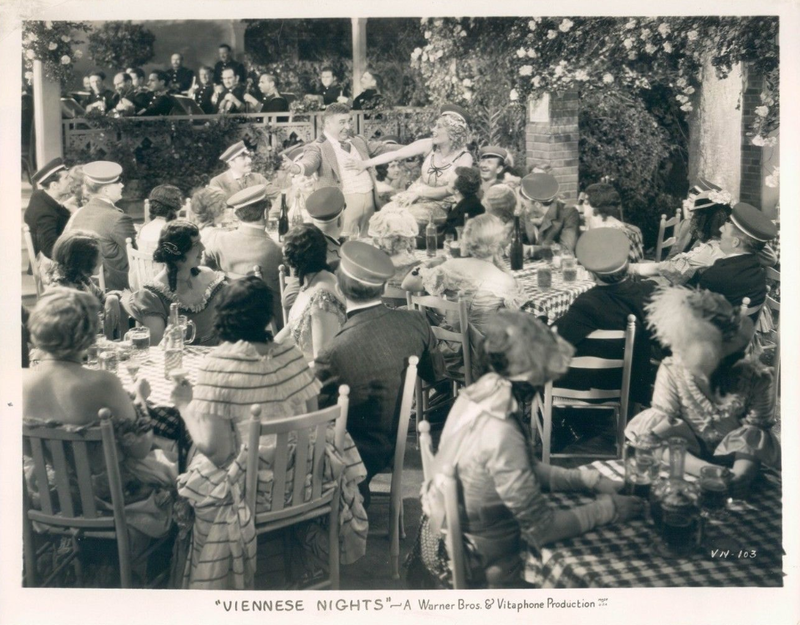 Vivienne Segal has at last her opportunity in this picture, for not only is her voice nicely recorded; but she looks far more attractive than she has in other cinema productions. This is especially marked in the penultimate scenes. 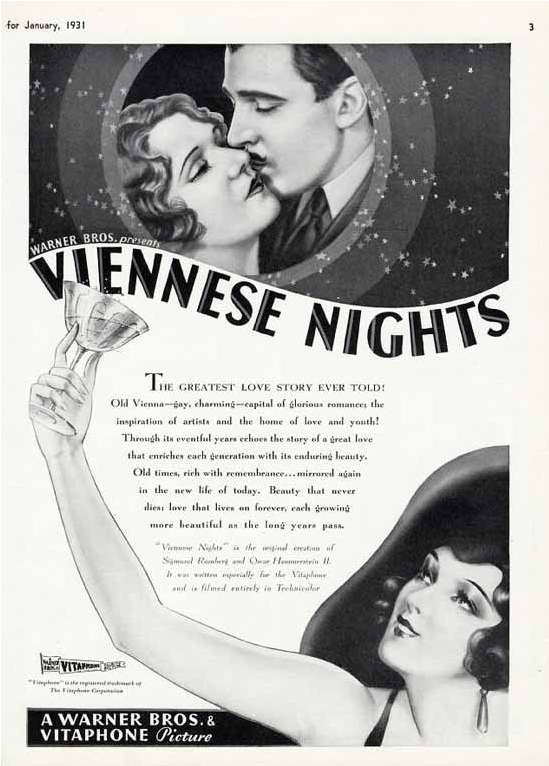 This romance begins in Vienna in 1880, when Otto, a budding composer; Franz, a young nobleman, and Gus, a comic individual, are beheld on the eve of joining their regiment. Later, when the troops return, Elsa goes to the balcony of her home and both Otto and Franz are captivated by this charming girl. Hocher, Elsa’s father, at first appears to have a kindly nature, but subsequently he arranges matters so that Otto is led to believe that Elsa is in love with Franz. The composer imbibes too freely of wine and then makes a fool of himself and Elsa therefore cannot be blamed for choosing to become the bride of the philandering Franz. 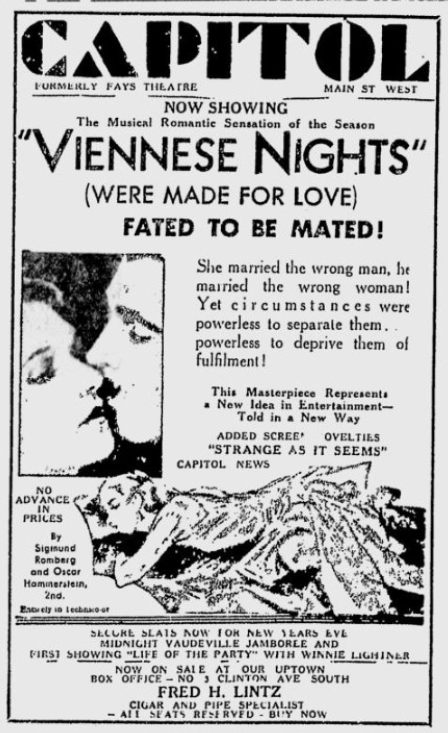 The stupid Otto, instead of remaining a bachelor, marries a nagging woman who has no sympathy with music. This is stressed with a vengeance by Mr. Crosland, who depicts the tired Otto, eleven years later a second fiddler in the opera in New York, trying to compose music on a piano while his wife is volleying her disapproval from her bedroom and urging her husband to take a job in Gus’s highly successful pickle factory. 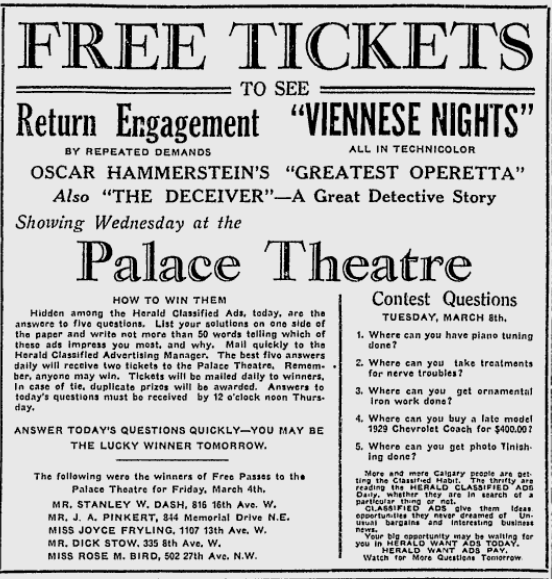 One night Franz and his wife attend the opera and Elsa recognizes Otto. After the performance she bids the musician ride in her carriage through the park, but although they both declare their love for each other she decides to accompany her husband back to Europe. When a subtitle announced that forty years pass, the audience last night was rather amused. Soon one perceives Elsa as a gray-haired woman who is inveigled into going to listen to a new composer’s symphony played by a large orchestra. Otto’s son has also studied music. He succeeds where his father had failed. Elsa rises out of her wheel chair, after leaving her seat in the hall, and limps back to listen to the music because she hears a familiar theme composed by the unfortunate Otto. Although Mr. Crosland lingers here and there on some pet idea, his direction is far superior to most of his pictures, and certainly infinitely superior to his recent contributions. Mr. Hersholt gives his usual diligent care to his part. Mr. Pidgeon is fair in his rôle. Bert Roach is rather out of his element in such a story. The Technicolor camera work is a little dark in some of the scenes, but it has its good points in others. In showing a butcher’s shop, the Technicolor camera men ought to beware of raw meat, for its tint is anything but real in a flash of this film. The glimpses of uniforms of officers and the gowns of women, however, benefit by this prismatic photography. 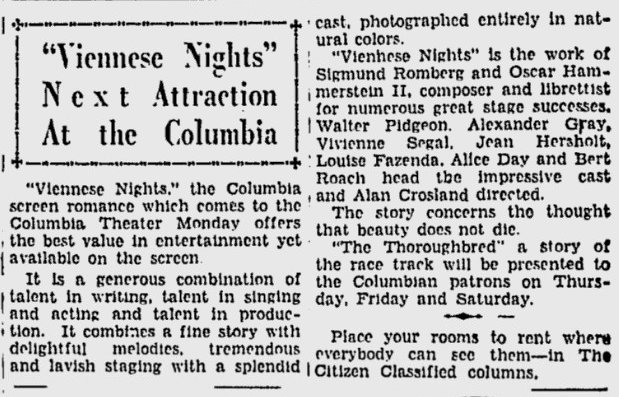 A Vitaphone Operetta in Technicolor. 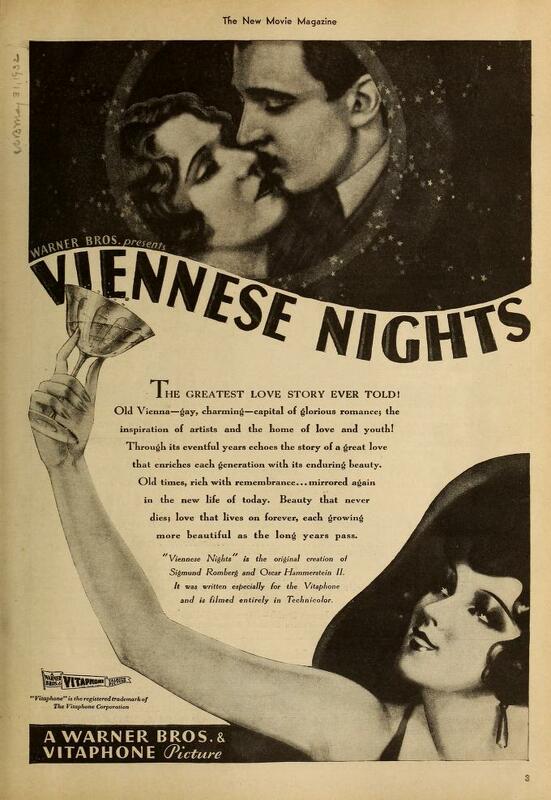 VIENNESE NIGHTS, with Alexander Gray, Vivienne Segal, Jean Hersholt, Walter Pidgeon, Louise Fazenda, Alice Day, Bert Roach, June Purcell and Milton Douglas, based on an original romance written for the screen by Sigmund Romberg and Oscar Hammerstein 2d, directed by Alan Crosland. At Warners’ Theatre.